We are mother and daughter together engaged (N) Sirena`s cattery. 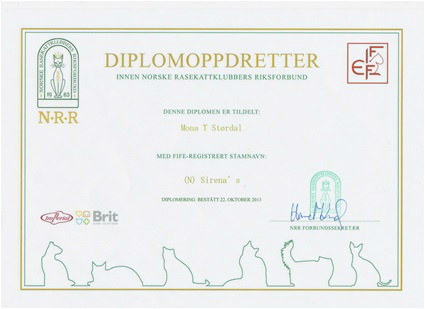 The Cattery name we received in 1989, and then had one litter on our white Norwegian Forest Cat. After that we had a longer break, until in 2006 we had our first litter with Turkish Angora. We live in two households, and owns several of the cats together even if they live in one or the other. This means that we can have several litters per year, and that we may have related cats of both sexes, where they live in each household. During 2016 we plan our first litter with Turkish Van, a breed that we got to know several years ago, and now finally can give others knowledge of. Are you planning to reserve a kitten from us, or do you want more information? Perhaps you want to have a kitten in the future or it best suits your needs to take over an adult cat who for different reasons are looking for a new home? Autumn of 2013 we were certificated breeder in NRR after passing the certification test with 0 errors. Many of the pictures on our website is taken by photographer Maria Wike Olsen. She has been in our home and taken pictures. We think she's very clever, and are delighted with the the pictures.